All Vegan bakery 137 Pleasant Street Morgantown, West Virginia. Offering sweet treats and tasty eats! Mini cakes, cookies, muffins, pies, bagels, "pepperoni" rolls, wraps, soups and more. Gluten Free items are always available. Special orders are welcome. 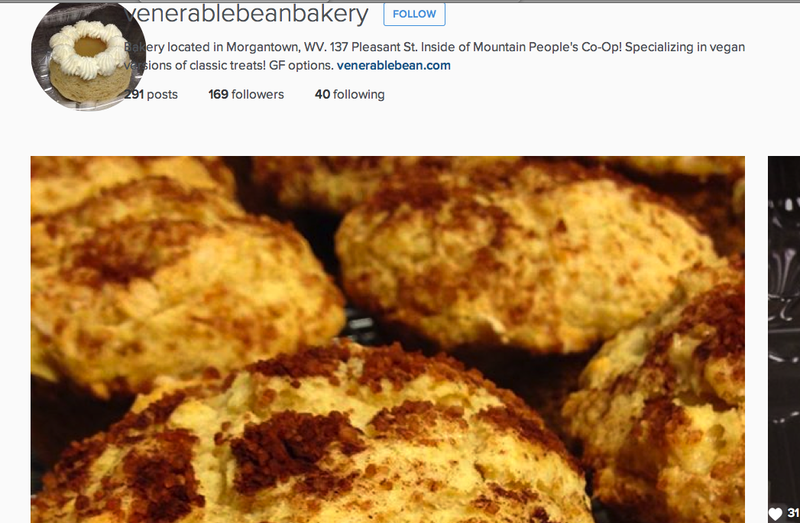 You can always purchase our fresh baked goods at Mountain peoples co-op in downtown Morgantown, WV. Since it's actually fall we will be rolling out some pumpkin goods! Pumpkin Pie Muffins. Oh, so good! Stop in and see us at Mountain Peoples Co-Op. Vegan Pepperoni Rolls & Everything Bagels are at Mountain Peoples Co-Op. If you are looking for more photos of tasty treats follow us on instagram @venerablebeanbakery !